Two primitive meteorites collected in Antarctica appear to contain grains of silica—the stuff of quartz and sand—forged in an ancient supernova that predates the birth of the solar system. In fact, some researchers believe that it was just such a stellar explosion that triggered the formation of the solar system from a cloud of dust and gas billions of years ago. Whether or not the Antarctic meteorites contain a record of that fateful cataclysm, they do contain a supernova by-product that has never before been found on Earth. 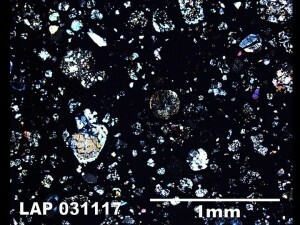 Researchers have identified so-called presolar grains in several primitive meteorites, which more or less preserve the chemistry of the raw materials from which they formed at the dawn of the solar system. Some presolar grains spilled into the molecular cloud that would become the solar system from nearby supernovae, and some seem to have arrived on the winds expelled from aging stars. In the new study, Pierre Haenecour of Washington University in St. Louis and his colleagues analyzed two meteorites collected in Antarctica in 2003, each named for a geographic feature near the spot where the meteorite fell. (Antarctica makes an ideal hunting ground for dark-colored meteorites, which stand out clearly against the ice fields.) Grove Mountains 021710, found by a Chinese expedition, and LaPaz Icefield 031117, collected by U.S. searchers, each harbor presolar grains of silica (SiO2), the researchers found, as evidenced by the grains’ enrichment in a heavy isotope of oxygen known as oxygen 18. That signature points to the grains’ formation in a type II supernova—the explosion initiated by the collapse of a massive star’s core. Other researchers had spotted presolar silica in meteorites before, but those grains had different isotopic signatures that indicated that they came from an aging star called an asymptotic giant branch (AGB) star rather than from a supernova. The conclusion by Haenecour and his colleagues that a supernova seeded our corner of space with silica grains, among other types of dust, lends laboratory support to a 2008 study, using the Spitzer Space Telescope, that spotted the possible spectral signature of silica in the remnant of a supernova that exploded in the Milky Way so recently that its light reached Earth just 300 or so years ago. Amassing and analyzing these presolar grains is more than just an exercise in interstellar history—a shock wave from a nearby supernova or the gentler expulsions of an AGB star could have stirred a cloud of dust and gas to collapse into the system of sun and planets that we inhabit today. Collecting presolar detritus allows astrophysicists a glimpse into the violent inner workings of dying stars and may ultimately help pinpoint just how the solar system came to be. About the Author: John Matson is an associate editor at Scientific American focusing on space, physics and mathematics.